The Algonquin, Haliburton and Muskoka regions offer a wide variety of mountain bike trails suitable for different skill levels. From Algonquin Park’s Old Railway Bike Trail suitable for families, to the professional Buckwallow Trails in Gravenhurst and downhill runs at Sir Sam’s in Haliburton there’s something for everyone. Looking to discover something new? Join us on Tuesday evenings in the spring, summer and fall for our weekly group rides, just bring your own bike or rent one of ours to experience trails not listed on this page. Algonquin Outfitters in Huntsville features a full-service bike shop with a complete line of parts and accessories for fixing or upgrading your bike. Our bike staff are riders who love the sport. If they aren’t in the shop chances are good you’ll find them out on the trails at local races. Location: The Minnesing Trail is located on the north side of Highway 60 at km 23. 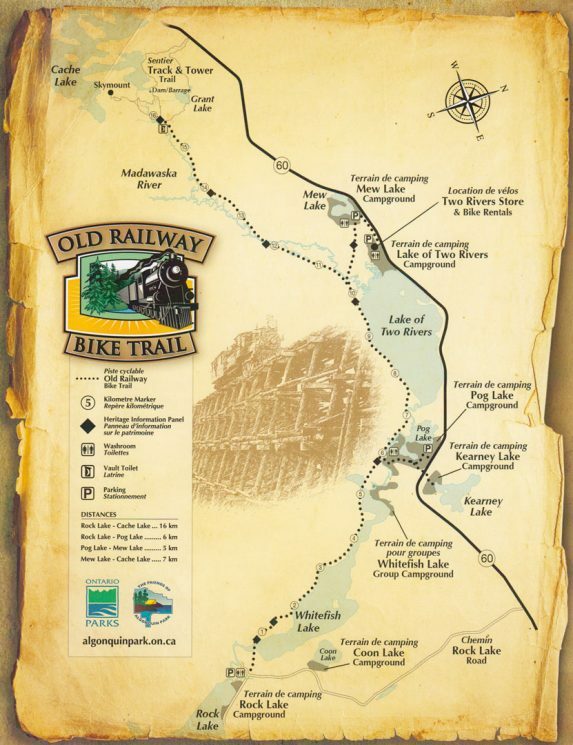 During the winter, the Old Railway Trail is best accessed via the Mew Lake Campground near the heated comfort station. Location: The trailhead is located about 10 km east from the Kingscote Access Point on the Elephant Lake Road north of Harcourt, Ontario. One of Ontario’s prime riding destinations, Buckwallow Cycling Centre has a great mix of buff singletrack, open fireroads and rocky technical sections to keep even the most capable riders on their toes. Buckwallow is one of the best maintained and diverse riding destinations in the region and worth every penny to ride there.